Donald Trump will remain in the presidency until we dislodge him. No matter how many millions of citizens want him gone, the means of achieving this goal before 2020 are narrow and few, and most depend on the inclination of other major government officials. In this review of the options, I conclude that Donald Trump is unlikely to be removed from office until his opponents become better organized and gain control of both the House and Senate. Click here for the audio version. Whether or not there are grounds for impeaching President Trump, impeachment depends on Congress’s will. As the US House website puts it: “The Constitution gives the House of Representatives the sole power to impeach an official, and it makes the Senate the sole court for impeachment trials.” Whereas initially I imagined that an anti-Trump coalition might emerge among Capitol Hill Republicans, that hope has died. A few Republican senators have criticized the president, but their opposition remains personal, episodic, isolated. Recent events show that Republicans have decided to collaborate with Trump rather than try to get rid of him. Were Congress composed differently, it would be another story. For now, though, Democratic efforts to have Trump impeached or censured are pointless, for the simple reason that Democrats are in the minority. Will the investigations of special prosecutor Robert Mueller—the so-called “Russia probe”—yield information sufficient to remove Trump from office? If Trump were himself a tool of the Russian government, I believe he would have persisted in trying to fire Mueller or constrain the investigation. * Trump has (reluctantly) foregone this route, even though his inaction leaves open the possibility that Mueller will eventually press criminal charges against Trump’s children. Information already made public shows how aggressively agents of the Russian government pursued contacts with members of Trump’s inner circle, testing how many ways they could succeed in corrupting and compromising Trump’s relatives, associates, and administration, and, with them, the American political system. While the Russians have reason to be satisfied with the success of their audacious experiment, the evidence so far available to the public falls short of establishing that Trump was personally involved. Were Mueller to bring out evidence that Trump colluded with or was compromised by the Russians, what would happen? Such evidence could compel the House to impeach, but, as long as Trump is a sitting president, he is largely immune from being charged with a crime. According to Cass Sunstein, writing in Bloomberg News, a sitting president can only be charged with crimes committed prior to taking his office or unrelated to his presidential role. In the unlikely event of Trump’s being impeached and convicted, only after being removed from office would he face trial for criminal wrongdoing. And never has a special prosecution produced such spectacular results. Impeachment is a serious drag on a presidency, but it’s a clumsy tool, in that Congress has never come to the point of kicking a president out. In the case of Watergate, Nixon preempted the process by resigning when the threat of impeachment loomed. Kenneth Starr’s lengthy special investigation prompted Bill Clinton’s impeachment, but ultimately the Senate acquitted Clinton, leaving him to serve out his second term. Because impeachment is a political but not a criminal proceeding, its outcome is highly discretionary and dependent on political factors. The only other president to be impeached was Andrew Johnson back in 1868; the Senate acquitted him, too. The 25th Amendment to the Constitution, ratified in 1967, allows the vice president and a majority of the Cabinet to declare a president unable to perform his duties, whereupon the vice president shall assume the president’s role. Dissatisfaction with Trump has led to increased discussion of the 25th Amendment, as if it were designed to remedy a president’s poor judgment or incompetence. Michael Wolff, in promoting his sensational new book, Fire and Fury: Inside the Trump White House, has encouraged this misconception by claiming that the 25th Amendment is under discussion in the West Wing “all the time.” A quick read of the amendment establishes that it applies only to fairly extreme conditions of physical incapacity, for it allows the President to reverse its effects by notifying leaders of Congress that he is again able to discharge his duties. Last week, the president’s first official physical exam concluded with Dr. Ronny L. Johnson, the physician in charge, proclaiming the 71-year-old Trump to be in “excellent health.” So wake up, America: unless the President is physically incapacitated, the 25th Amendment won’t be invoked. The president’s extraordinary behavior following the publication of Wolff’s blistering expose shows his sensitivity to embarrassment of a certain kind. Yes, Trump has a tough skin, but he hates it when people he respects, whose approval he craves, look down on him. He hates being confronted with evidence that he is anathema to others who are powerful and celebrated. Trump looks down on reporters and many of his political rivals, but he is sensitive to criticism that leaves him feeling one-down. Leading activists have yet to zero in on what symbols can be used to dog Trump and effectively heighten his sense of shame. Protests against Trump should be orchestrated around the goal of making the president miserable. Could a strategy of social shaming drive him from office? It might, if it eats away at his sense of self and robs him of the pleasure he derives from his job. Nixon resigned from office mainly because he had been disgraced. The stigma was a punishment that never went away. The uncertainty of these options suggests how important it is that Trump’s opponents direct their all toward ousting Trump’s Republican collaborators from the US House and Senate. The GOP is in a weak and troubled condition, and Republicans in Congress, still loyal to their party, have concluded with good reason that if they do not collaborate with the mercurial Trump, their party will fail. Their numerical supremacy can’t palliate the ideological fissures and Faustian compromises eroding their party’s integrity. As Democrats lay plans to defeat incumbent Republicans in November, they should remember the millions of moderate Republicans and independents who are looking for a new reason to go to the polls. Whereas a tilt to the left will not strengthen the Democrats’ alarmingly weak share of political power, with a fresh, moderate ideology, the party could attract thousands of new voters and prevail. 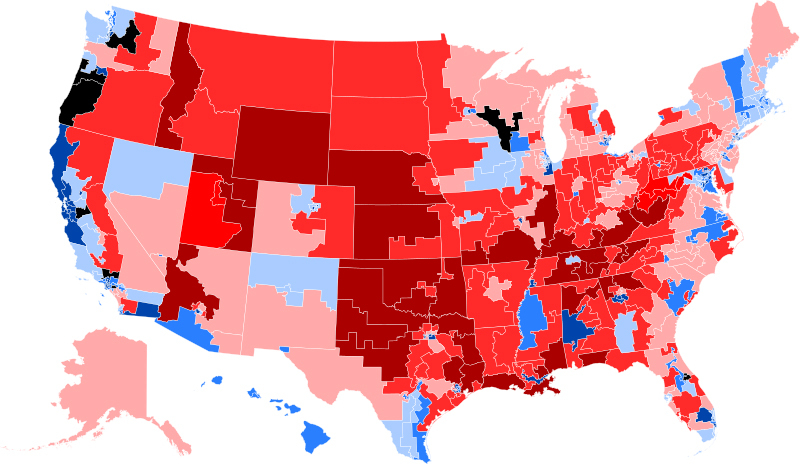 using Cook Partisan Voting Index scores for the (current) 115th Congress. * This sentence, the subject of discussion in the comments section, has been modified from its original version. Interesting argument, but I’m not sure we can entirely rule out the ‘Manchurian Candidate’ scenario on this basis. Basically, I think this argument underestimates the power of state institutions and, even in the present, partisan context, the way separation of powers constrains the actions of a President. An acquaintance who is Russian, when asked about the Russian interference, immediately characterized this as “a game,” such as nations often play for the sake of prestige. In the present era, both the Russians and Chinese are better at this sort of game than the US is. If our hackers were as good as the Russian hackers, the US would have found a way to retaliate, say by releasing embarrassing secrets about Putin, back during the campaign, thus evening “the score.” When nothing of the kind happened, I concluded this was because either 1) Obama did not get this game, or 2) the US was simply not capable of equaling the Russians when it came to a politically focused hacking operation. That the US has never found a way to embarrass Putin by releasing unwanted information about him speaks volumes about how inadequate our cyber-warfare capability is. Trump is dogged by the charge that he sought to obstruct justice early in his presidency. I think even he grasped that moving to replace Mueller would compound that problem. But was Trump’s motive collusive or merely personal? I think the latter. Citizens may never know the truth, especially if they remain distracted and do not focus on the massive challenge of improving the character of the Congress. Thanks so much for writing in. Always great to hear from you. Apropos of our exchange, it seems NYTimes is reporting that Trump did try to fire Mueller but was dissuaded when his lawyer threatened to quit. Yes, I see. My object here was to think out how the various “excitements” and “murmurs” fit together. What is likely to come from it? I can imagine criminal charges being brought against Trump’s children, for instance, but can I imagine this US House drafting articles to impeach Trump, even on obstruction of justice? No. I will be surprised if in the end Trump resigns or is impeached. Geez, I so very much enjoyed reading your post! It is exquisitely written and thought out. . . . No, dis-lodging that dog won’t be easy at all. I highly doubt that Mueller’s investigation will nail Trump. Even if he ( Mueller ) pointedly recommends that Trump be impeached, as you mention, there are too many GOP collaborators who won’t do a thing. . . . I just hope that the Dems will win the House and Senate in the mid-term elections; otherwise the country will be stuck with the bum for another two years. The State of the Union is on Tuesday: it will be interesting to see how much applause he gets from his congressional collaborators. . . .
“Susan, in my small corner of the world, connected to the steel industry, I have seen a steady increase in steel and aluminum prices. Those purchasing the materials generally complain first about the price and then say, “I think it is for the greater good and is effective.” Then go on to say something about how they support the direction we are now heading with foreign trade. In my small corner there has been steady construction and business expansion since the last election. “When then Donald Trump entered the race for president I thought it was similar to when Ross Perot ran for president. All Ross accomplished was to aid Bill Clinton in getting into office by splitting the conservative vote. I did not yet realize what a powerful force then Donald Trump was, as he took the Republican nomination away from 16 other candidates by very intelligent use of stick and carrot. “By listening to the politically incorrect yet honest and accurate view he has of events relating to our stagnant, bloated government I was convinced he is exactly what we needed to steer our wandering government back toward American prosperity. Since we elected him he has proven time and again that his promises are real and are actual goals. Quite contrary to dislodging him, my hope is that those who expected a Democrat to win will begin to see what is happening under President Trump’s leadership and support him. I want to live to be a healthy old man, travel, visit family and friends, to have healthy and prosperous great grandchildren. I think it is much more likely under a Trump Presidency than others of recent decades. “In the primary he used honesty and respect as long as honesty and respect was offered to him. But he is certainly not afraid to take the gloves off. Farmr Dave–Thank you for writing in. It has been years since I last heard from you–welcome back! I have also written about the overproduction of cheap goods that has led to us to favor access to foreign markets over a more modest but secure style of living at home. (See “How Much Do We Need?”) At some point, Americans will begin to weigh the benefits of cheap goods against other social goods, such as supporting one another through internal trade and other types of relationships that a protected economy offers. The US has practiced free trade for so long that the new tariffs’ long-term effects on American business and on the state itself are hard to fathom. The tariffs will bring vast amounts of money into the federal coffers, improving the balance sheet without increasing taxes on citizens. Many Americans are uncomfortable buying Chinese goods. Now they will see more imports from other nations that do not pose such a threat to the preeminence of the US and perhaps even practice democracy. Right now, American soybeans are at a very low price, but China’s demand for soybeans is so great that eventually the price of our beans, and the price of beans worldwide, is likely to rise. I regret that Trump is a mean and vulgar person. He lacks the personal respectability that Americans look for in a president, an official who is supposed to function as “the people’s sovereign,” mirroring what is collectively best in us. At the same time, I agree that he is likely to change the political landscape around him, forcing others to confront the uncomfortable issues that it is in the best interests of the country to resolve. Thank you again for writing in. Even with respect to those who disliked and opposed Trump it must be said that Americans have the president that they deserve.